On Grand Lagoon, this condo was completely remodeled in the spring of 2003 using earth tones to give you the feeling of being right at home. The carpet was replaced in 2006 and tile was laid in the kitchen and baths in 2008. The kitchen was remodeled in 2013 with modern appliances and a new counter top and back splash. The pool is right out the back door with a view of the boat dock and Grand Lagoon. 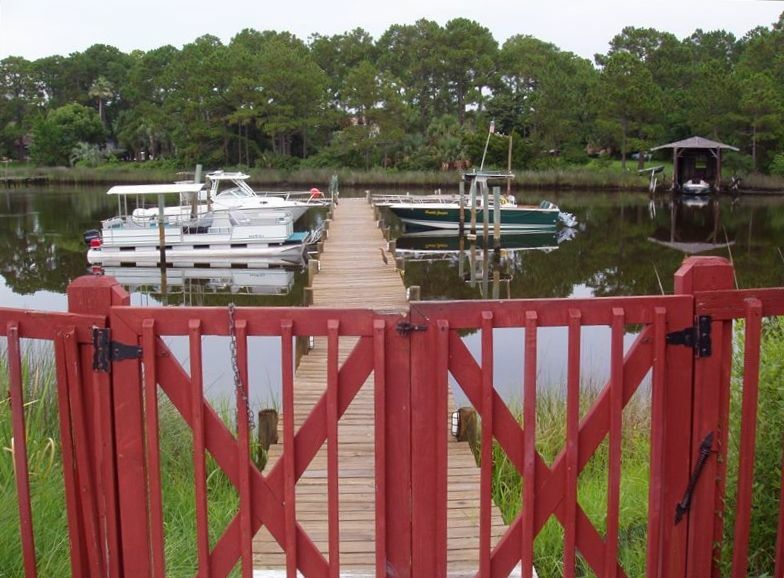 The rich decor, covered patio, close proximity to the pool and boat dock, make this rental a must for fishermen, divers, boating enthusiasts and sun worshipers. The emerald colored shore with sugar white beaches is 300 meters away. The master bedroom has a private bath, king size bed, 19' TV with remote and a clock radio. Two more people can sleep on the queen size sleeper sofa in the living room and take over the 1/2 bath down the hall. The dining area seats four, and is separated from the kitchen with a breakfast bar that seats two. On the patio, there is a table for four if you wish to dine outdoors. A fully equipped kitchen includes dishwasher, cook top range, microwave, coffee maker, toaster, blender, refrigerator with ice maker, place settings for eight and a new set of pots and pans. This beautiful earth tones condo also includes a stackable washer and dryer, stereo tuner with CD player, 32' TV with remote, cable, and DVD player. For our long term winter time guests, the condo features extra closet and storage space. Kevin and Teresa currently reside in Savannah, GA. Kevin is an aircraft mechanic and commercial pilot. Teresa is a part time hairdresser. We purchased this property after traveling to Panama City to fish offshore. The boat dock was the primary reason to purchase this unit so we can tie up our boat just steps from the back door without having to go to the boat ramp every day. Private dock with boat slip for $50.00 during your stay, the dock features water wash down station, 110vac 15 amp receptacles and fish cleaning station, Boat trailer parking is provided in the parking lot near a water source for engine runs and wash down, We provide two spinning rods for our guests to use off of the dock, you just need to buy some bait and tackle. There is a 6' deep swimming pool, clubhouse w/ restrooms, sauna bath and charcoal grill near the pool. Use two beach chairs and two beach towels that we provide with our compliments. Lighted tennis courts with two racquets and balls in the closet for you to use. Loved that it was convenient and close to everything including the beach!!! You could walk or even drive across there was public beach parking which was wonderful! Beautiful pool and pond out the back door! Amanda had the place smelling amazing when we walked in everything was very clean :)! Hope to be back soon!! I would suggest maybe a tea jug lol we went to 3 different stores and couldn’t find one??!!! How crazy is that?! But we made it work we had to have our good ole sweet tea fix :) thank you Kevin and Theresa for a wonderful cozy place ! The condo was beautiful inside and out! Perfect location! Walking distance to the beach. The pool was right there behind the condo and lit up at night which made it pretty to look at after hours. I would definitely stay here again!! Stayed there and celebrated,my 61 Birthday, with my daughter’s and my granddaughter and it was an amazing place. Close to everything, beach was a few minutes away, Pool right in front of the condo omg I love it...Very clean Condo , kitchen was heavily equipped to cook meals. And Amanda the housekeeper was extremely helpful. We will be returning. It was a really really nice place away from home.. I loved my experience.. everything was walking distance I will definitely book and stay here again !!!!! Nice little condo perfect for our family of 4. Kids loved the pool right out the back door and the oh so beautiful beach is just a short drive, basically across the street with plenty of parking at public beach access ! You can tell it’s an older property but the condo, pool, etc are well maintained. Ours was very clean and I cooked every meal the kitchen was well equipped with everything you need. Appliances, floors, bathrooms all updated within last few years. Kids like being able to play tennis with rackets and balls provided in condo. Husband and son fished several times off the dock they caught and released quite a few fish which was great fun for our 7 year old. We will be back soon!